Title : James Richards, Crumb Mahogany, 2016, courtesy the artist and Galerie Isabella Bortolozzi, Berlin, Cabinet, London and Rodeo. 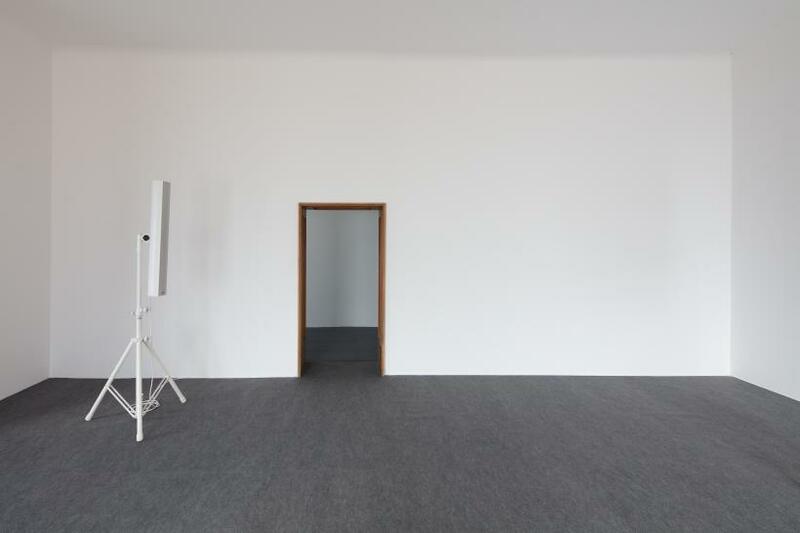 A minimalist austerity invades Isabella Bortolozzi’s two locations, which present two sound installations by Cardiff-born artist James Richards. 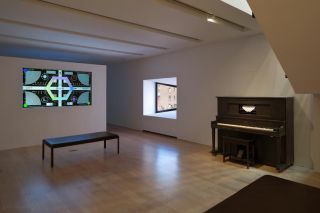 ‘Mouth Room’ (2017), which takes its name from Stuart Marshall’s 1976 video, spans both rooms at Eden Eden, while ‘Crumb Mahogany’ (2016) is presented in the main gallery space. 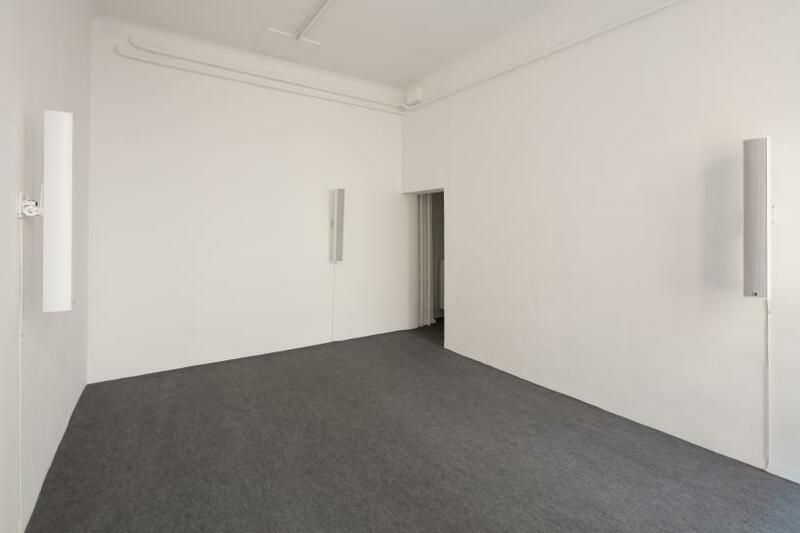 In both galleries a grey floor connects the rooms, the walls and ceilings are painted white, loudspeakers are mounted on the wall or on free-standing pedestals at the height of an adult and everything is immersed in stark lighting. 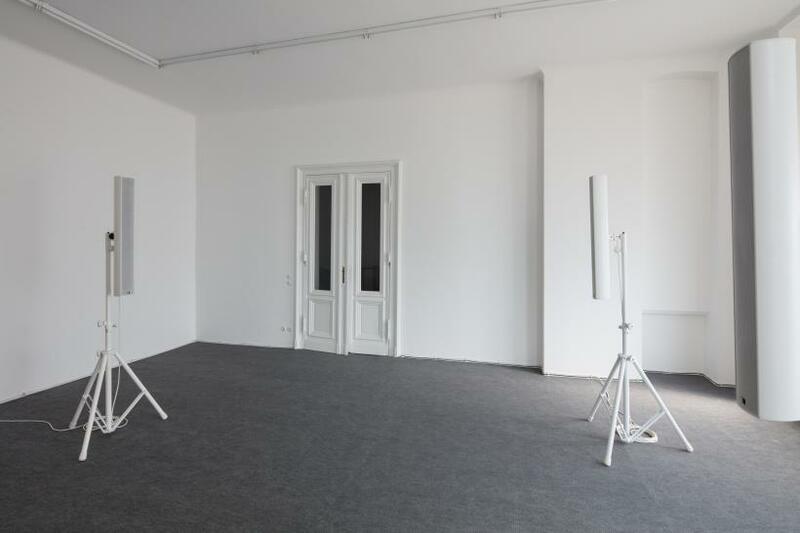 There are no images or videos to look at – only the nakedness of the sounds flooding the floor. Vibrations seemingly emerge from nowhere, as suspended spirits floating then dissipating in the air like icy breath. There is an architectonic simplicity, which seems to show a world without human beings, a new mutated landscape shaped by interlaced forces of nature and technology, reality and hallucination, the past and the future. 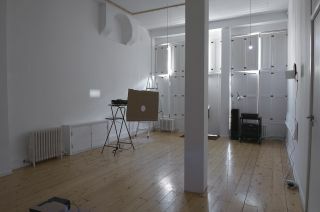 I start moving around the first room at Schöneberger Ufer 61. 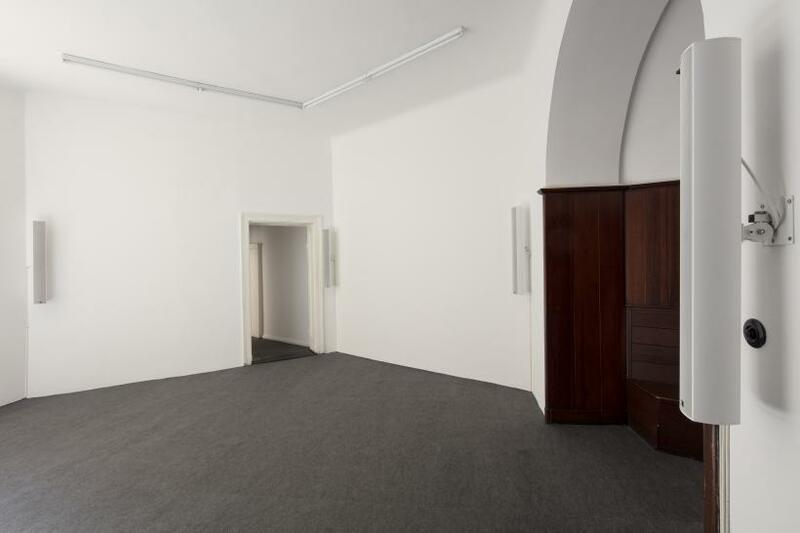 ‘Crumb Mahogany’, staged previously in 2016 at Bergen Kunsthalle, ICA London and Kestnergesellschaft, Hannover, resonates through the gallery and the space appears as infinite. There is an ambiguous and unsettling mix of glimmering voices, industrial and ephemeral sounds, percussions and repetitions. I slowly walk forward and around, from one speaker to the next; I stop abruptly hearing a cavernous noise, then I sit on the floor. Familiar yet obscure melodies rise just behind me – mashed and assembled together, these complex sound strata create an enigmatic event which I have no means to explain. 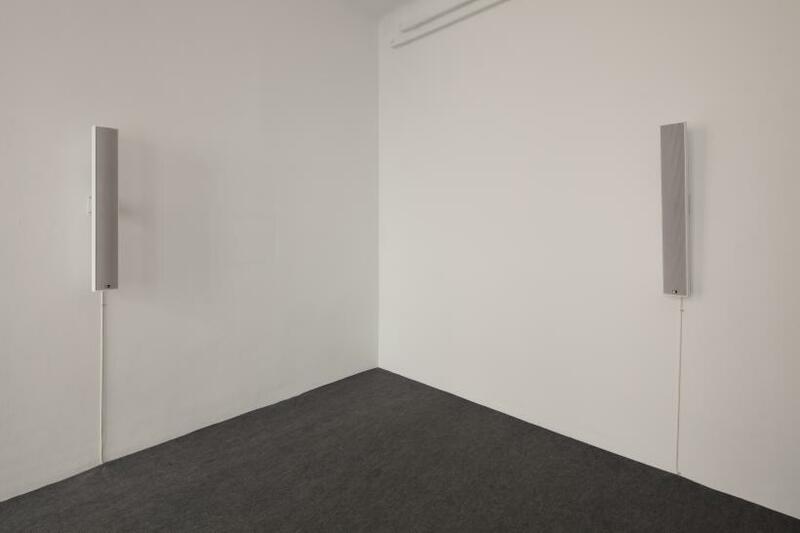 Their arrangement and juxtaposition, shifts and interruptions, climaxes and anticlimaxes, feature a number of psychological and physical associations, and evoke a sensation of both great proximity and distance within the artwork. Things come in and out of focus and my feelings shift from tension to lightness and flow. 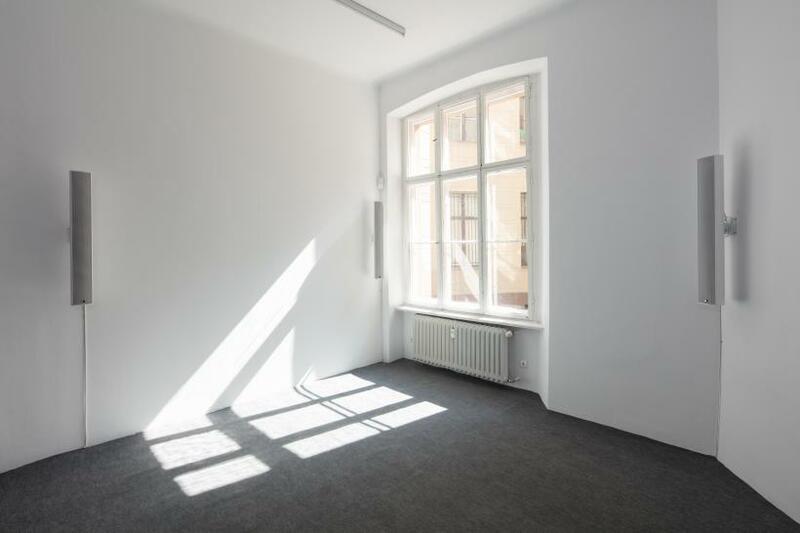 After almost an hour, I decide it’s time to head to Bülowstraße 74, where ‘Mouth Room’ (2017), a new production developed for the two large rooms at Eden Eden, makes space tangible through its constellation of sounds. 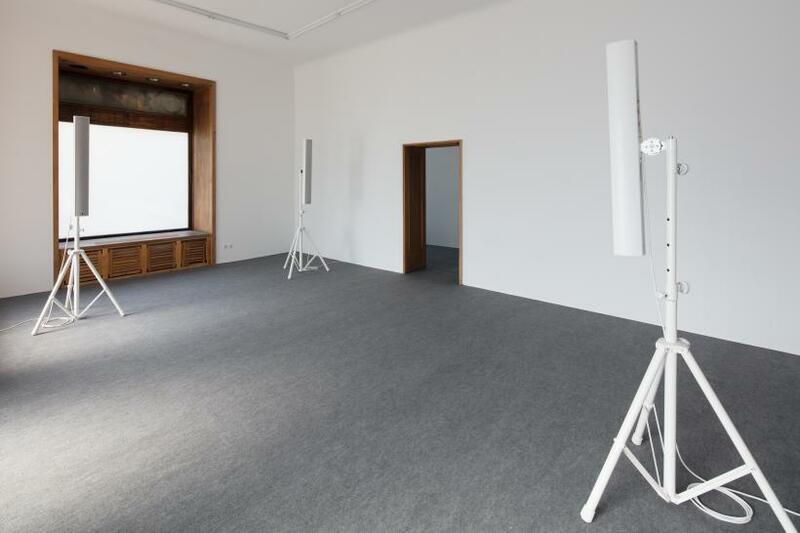 The work plays with the voice, as an improvised or experimental tool for expression and communication. 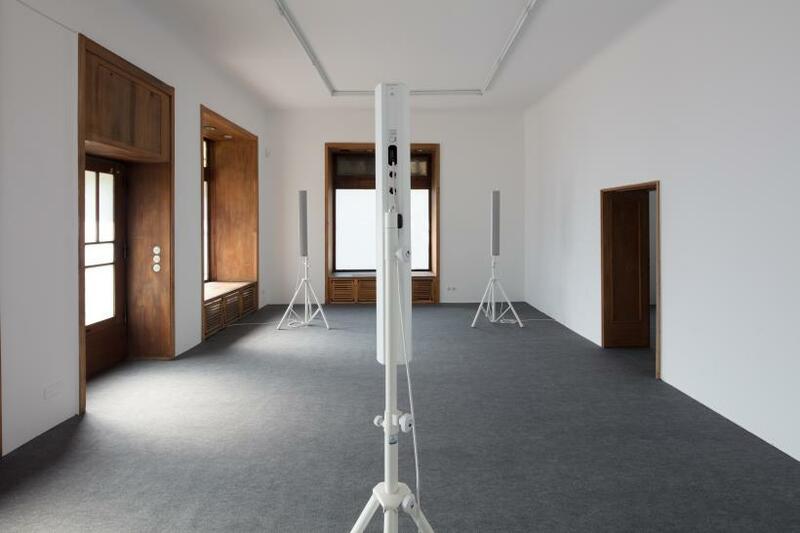 These hundreds of live speech fragments have an intimate quality, and give me a sense that what’s happening is either private or ritualistic; voice and word are performed in states of abstraction, poetry or song. 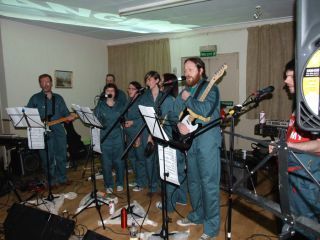 Sometimes Richards’ compositions separate the two rooms, producing different streams of audio; other times, they synchronise, unifying the two spaces. ‘Mouth Room’ and ‘Crumb Mahogany’ keep us perpetually off-balance thanks to their qualities of transformation and remembrance. They steer emotion, feed nostalgia, seduce and invade the silence. They remind us of the transiency of life, the fragmentary experience we perceive as humans, our inescapable isolation: all painful qualities that also provide pleasure.